HD Squared Architects, LLC is located in Edgewater, MD on the edge of Annapolis as well as a satellite office in Cheverly, MD. As Principal and Owner, Melanie Hartwig-Davis, AIA, LEED AP BD+C, has been creating efficient, functional and beautiful spaces for the natural and built environments for almost 20 years. Sustainability is the marriage of the design process with a technical understanding of site, energy, water and materials. The design team at HD Squared is proud to immerse ourselves in this relationship in order to improve our existing environments. Our goal is to make our clients` lives better by creating quality spaces. We do this collaboratively with the homeowners' goals and budget at the forefront. Contact us today to discuss your potential project. It would be our pleasure to assist you in reaching your goals in improving your home. Kirk Allbright and David Bullock provide high-end residential design services with 25 years of experience and award-winning talent. Contact us today for more information. With our wide variety of house plans & elevations, and our flexibility to customize our plans to fit your family’s unique lifestyle, you are sure to find your dream home with us. David Miles, owner of The Drawing Board, Inc. graduated from the University of Maryland's newly established School of Architecture with a Bachelor of Architecture in 1978. From there, David worked at a variety of architecture firms, working towards licensure, which he achieved in 1981. Two short years later David set out on his own. Working on a steady supply of commercial projects, such as restaurants, day care centers, churches, and medical facilities, David quickly built up a reputation as a diligent and conscientious architect. As the workload grew in both size and building type, with many new residential projects on the boards, David made the decision to reincorporate with two partners as The Drawing Board, Inc., in 1991. In 2010, David was joined by his son Peter at The Drawing Board. After completing his Master of Architecture degree in December 2015, Peter has decided to join the firm full-time, working daily with David to help the firm adapt to the challenges of the twenty-first century economy. Twenty-five years later, The Drawing Board, Inc. has completed projects throughout the Mid-Atlantic region, and has an diverse and exciting mix of current projects. With the firm now on the leading edge of technological adoption and innovation, we have now turned our attention to discover innovative ways to deliver projects and design services to our clients. The Drawing Board prides itself on maintaining a small network of experts, so when you are in need, you always know who to call and who can help. For both David and Peter, their passions for traveling and photography have found their place as a source of inspiration for their work at The Drawing Board. As an intergenerational firm, we bring different perspectives, skills, and ideas to projects. As a family-owned company, we have the trust and relationships to properly blend the ideas and energy of the younger generation with the wisdom and experience of the older. This trust is critical to our work ethic and process- it allows us to bring you the best of the new, ignoring fads, trends, and other fashionable ideas, while still introducing energy and progress to our projects. 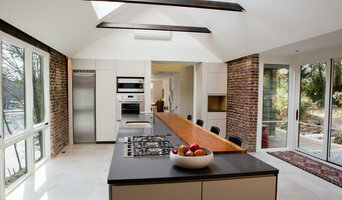 We offer creative solutions for custom homes and additions from NY to DC. With 20+ years of award-winning commercial and residential experience, Jonathan brings insight to every project. With almost 10 years of experience in residential interior design, Corey believes that interior design and architecture go hand in hand and should be aesthetically pleasing as well as create a livable and functional space. Corey has her degree in Interior Design from the CIDA accredited Design Program at High Point University where she was exposed to all aspects of the design industry with the furnishings capital of the world right in her backyard. An Allied member of ASID Corey is striving to become a certified ASID professional by completing the NCIDQ requirements. Chesapeake Area Architect Best of Houzz for Design and Service! Published in Annapolis Home and Chesapeake Home magazines, we are the "think-out-of-the-box" firm, with fresh ideas and attention to detail. Since 2001, Karen Pitsley, AIA has been creating beautiful and functional spaces for homeowners in Maryland and beyond. In 2008, she founded Transforming Architecture (TA) and implemented "Custom Designs, Flat Fees." The spaces designed by TA are known to be sensitive, beautiful, and connected to those who inhabit them. TA specializes in Aging-In-Place and Universal Design. With long-term clients such as Bello Machre (www.bellomachre.org) a non-profit agency which houses developmentally disabled adults and numerous first floor master suite addition clients, TA has the expertise to help homeowners stay in their homes longer. You deserve an Architect. Call 301-776-2666 to schedule your free consultation today. When hiring Morse Contacting you benefit from 20 years of expertise as a home builder, remodeling & renovations specialist & modular home seller. Call or email us today. Energy Wizard has the expertise, the talent and the resources to focus on your project and to run your project the way it needs to be run. 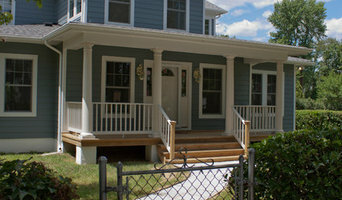 With 50+ years experience in design build, we pride ourselves on being a one stop shop. You have full access to all architectural design & an interior designer that will cater to your specific tastes! The practice at SPIRE is to provide comprehensive services, offer quality design to clients, resources for permitting and constructing, along with connections to industry design professionals. Precision homes always exceeds expectations. From expert construction management to the finest touches and the latest energy-efficient systems, this is Precision. Free download of our latest book! Annapolis Area Custom Home Builder & Remodeler Best of Houzz Winner! TailorCraft Builders is a full-service design/build, custom home builder and remodeler serving Anne Arundel County and the surrounding area. As Residential Builders, we specialize in Custom Tailored Homes, Visionary Additions, Inspiring Renovations, and Resourceful Accessory Buildings. Halpern Architects is known for its high quality, and affordable waterfront and custom homes and additions in a broad range of architectural styles. Let us help you to bring your dream home to life.